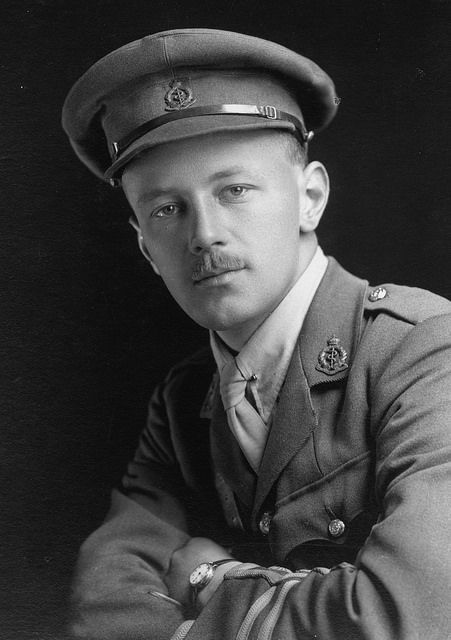 Captain Gavin Alexander Elmslie Argo of the Royal Army Medical Corp – 21st Field Ambulance – Image from Imperial War Museum Flickr account common license. 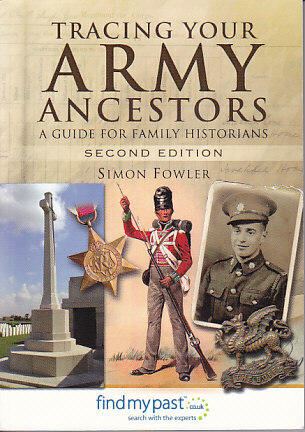 Index to my Military related Blog Posts – On Friday of this week I am doing a three-hour workshop on tracing your British Army ancestors at the British Isles Family History Society of Great Ottawa conference in Ottawa, Canada. In preparation for that I wanted to pull together an index for the blog postings I have had on the site so far dealing with British military resources and news. Most of the postings have focused this year on World War I, but there are additional items of military interest. Some of the posts explain in detail how to use or interpret the results found in a military resource, some deal with a search process that by choice has a military example. The list is an index for blog postings so far. Boer War – large but incomplete index and how to understand what is in a dataset. Soldiers Died in the Great War and Officers Died in the Great War are two sources to use for those who died during the war, after one has done a search of the Commonwealth War Grave Commission site, explained in three earlier posts (part one for John Croudace – this same soldier, part two and part three). Soldiers Died in the Great War consists of 80 parts, published in October 1921 by the War Office and printed by His Majesty’s Stationary Office. They have been reprinted by J.B. Hayward. They have been transcribed and issued on CD-Rom and are also available online, and I will return to this later. The original 80 parts cover all British Regiments, Artillery, Engineers, Machine Gun Corps, Service Corps, Labour Corps and miscellaneous units. The people not included in these volumes are the sea soldiers (Royal Marines, Royal Marine Light Infantry or the Royal Naval Division) or the airmen other than the officers of the Royal Flying Corp and those attached to the Royal Air Force. The part for each regiment is divided up into battalions with the casualties listed alphabetically by battalion, with the exception of the Worcester Regiment which arranges its section with all the A’s by battalion, followed by all the B’s by battalion. The information listed includes: surname; first name(s); place of birth; place of enlistment; place of residence (in brackets); regimental number; rank; how died (d.=died; d. of w.=died of wounds; killed= accidentally killed; k. in a.=killed in action; d. at sea=died at sea). Officers Killed in the Great War is the companion volume to Soldiers Died in the Great War and may give more details on how they died (e.g. as prisoner in German hands, killed by his bearer, murdered by tribesman, etc). Searching Online – can be carried out on both FindMyPast and Ancestry. 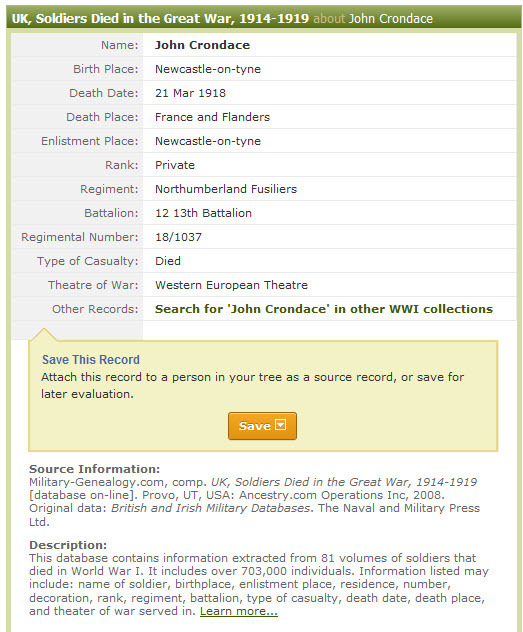 The database on both sites is the Soldiers Died in the Great War, but it actually includes Officer Killed in the Great War. Both online indexes use the same dataset provided by Naval & Military Press Ltd, thus you are not likely to get any difference in results when searching on one site verses another. – Spelling errors – any printing errors in the original publications, such as in the example Crondace instead of Croudace, will be picked up in the online indexes. – Casualties in Italy may be labelled as Italy or more likely to be labelled F&F (France & Flanders) so compare with burial site on the Commonwealth War Grave Commission website. – The lists commonly show France & Flanders but you need to check the Commonwealth War Grave Commission website to see if the soldier died in France or Flanders (Belgium). – Most regiments only record death up to Armistice Day (11 November 1918) thus do not pick up soldiers who were dying of wounds received or who were still fighting in the later campaigns. – Usually for soldiers only one regiment is identified and this is most likely the one in which he enlisted – which may be different from the one he was attached to when he died. With officers multiple regiments may be identified. – The rank identified is the highest achieved overseas while on active service and may be a temporary rank. Early Registration Closes September 15 for the British Institute. The 2014 British Institute to be held 20-24 October in Salt Lake City is organized by the International Society for British Genealogy and Family History. Scottish laws, regulations and records are different from the rest of the British Isles, yet with enough similarities to create confusion for the unwary. This course will address the fundamentals of all the major record groups, examining how to search the indexes, exploring what is and is not available online. Case studies will highlight the research and record evaluation processes to determine next steps. Individual consultations are available to assist each participant with their personal research. This course is designed to help the student of Irish genealogical research, whether beginning or advanced. Strategies for establishing a sound beginning and building on that foundation using proven research techniques will be coupled with an understanding of what records sources are available online, on microfilm and in Ireland. Individual half-hour consultations are provided with the course coordinator to assist each participant with ways to extend their research. Welsh family history is different from other localities in some significant ways. Those differences are not impossible roadblocks. Understanding the peculiarities is a good first step to success. Record knowledge is important but not the key. Understanding how to search, evaluate evidence and collate information will resolve many difficult research situations. This course will provide examples of problems, aw well as strategies and skills for learning more about your ancestors. Through hands-on activities, lectures, and discussions, participants will learn how to use widely accepted standards to measure their genealogical work’s accuracy and to assess others’ genealogical conclusions. In the process they also will learn about genealogical research planning, its implementation, genealogical reasoning, and the preparation of credible genealogical products. Yes, I am teaching the week long course on Scottish Research so do come join us.